Lately I have been trying to take better care of my skin by using more natural products. 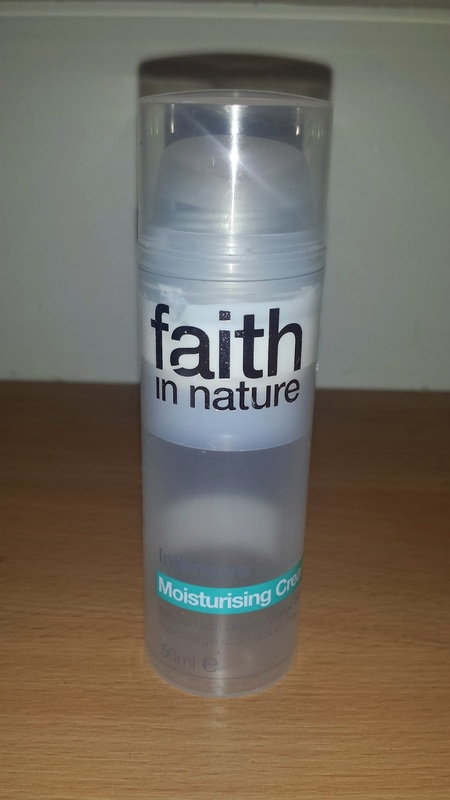 One of my first purchases was the Faith In Nature Intensive moisturising Cream. I bought it from one of the Wholefoods branches in London and it cost me £6.65 for a 50ml bottle. It contains some really good ingredients such as coconut oil, sunflower seed oil, aloe vera juice and shea butter. (A full ingredients list is at the bottom of this post.) The majority of the ingredients are either vegetable derived, organic certified, community certified or from essential oils. I have used more than two thirds of the product since I purchased it. I have been using this product for the past two months and I have used it every morning and night. It has a very creamy texture and it absorbs into my skin very well. The smell is not very distinctive and it resembles the fragrance of an average face cream. Most of the time it provides my face with adequate moisture, however, it is not the most moisturising product that I have used. Sometimes my face still feels a little bit dry when I use this to replenish moisture after thoroughly washing my face with face wash. This product is good when I use it on skin that doesn't feel too dry before use, for example, when I use it during the day or after light cleansing with face wipes. I do recommend that people give this a try because it is fairly reasonably priced for a product that contains a lot of natural ingredients and it is hypoallergenic and paraben free. Have Your Business Featured On The Business Spotlight Page!